Different buildings have differing needs for aesthetics, performance, and functional operations. Few building materials have as great an impact on all three of these areas as glass since it plays a unique and important role in building design and the environment. The use of glass in buildings affects design, appearance, thermal performance, and occupant comfort. Historically, glass was used mainly for windows to admit air and light, but with advanced manufacturing options and the need for high-performance buildings, it is now integral to interior and exterior architecture. From facades, skylights and walkways to revolving doors and glass box extensions, glass is being used to do much more than just let light in. Therefore the selection of the right types of glass is a crucial element of the design process to create solutions that address thermal control, energy efficiency, views, and lighting quality as well as light quantity. Architects who understand the full range of possibilities available from glass manufacturers are able to use them as a complete palette to create designs that excel in all areas. The main ingredient of glass is SiO2 (silica sand). During the first half of the 1900s the predominant glass manufacturing technology was to create plate glass from molten SiO2 which moved along rollers while still heated. This created imperfections in the surface of the glass that needed to be ground and polished to produce parallel surfaces that were optically clear. During the 1950s and 60s Sir Alastair Pilkington invented and perfected the process of creating float glass which has become the current world standard for the production of high-quality glass. Float glass is manufactured by melting sand, soda ash, dolomite, and limestone, along with other minor batch materials to produce a continuous glass ribbon. The molten glass flows from the furnace and “floats” over a bed of molten tin where it spreads out to form a level sheet with virtually parallel surfaces. It is then carefully cooled to anneal the glass—a process that minimizes the internal stresses enabling it to be cut. • U-Factor: The thermal conductance of a material. The lower the number the better the insulation or thermal control. U-factors are often measured at various points in a window unit including the center and the edge of the glass. • R-Value: The thermal resistance of a material. R-values are the reciprocal of U-Factors (R= 1/U) meaning a higher number represents higher thermal resistance. • Solar Heat Gain Coefficient (SHGC): The ratio of solar heat gain through glass relative to the amount of incident solar radiation. The lower the number the greater the solar control. • Visible Light Transmittance (VLT): The percentage of light in the visible spectrum that is transmitted through the glass. The higher the number, the greater the amount of light that passes through the glass, regardless of its color. Visible light makes up about 47 percent of the solar spectrum, with wavelengths from 380 to 780 nanometers. • Ultraviolet Light (UV): About 2 percent of the solar spectrum with wavelengths ranging 300 to 380 nanometers. Although ultraviolet light is invisible to the human eye, long-term UV exposure contributes to fading and aging of organic based materials. 40 percent of fading comes from visible light other than UV. • Infrared (IR): About 51 percent of the solar spectrum, with wavelengths ranging from 790 to 3,000 nanometers. • Low Emissivity: Emissivity is the ability of a surface to reflect or emit heat by radiation. The lower the number, the more efficiently the object reduces radiative heat gain or heat loss, which means a lower U-factor and better insulation. Advances in glass technology give architects a wide variety of choices to meet design requirements for performance, aesthetics, and comfort. During float glass manufacturing, pyrolytic coatings are incorporated into the glass by depositing microscopically thin layers of metallic oxides using a process known as chemical vapor deposition (CVD). Having this type of hard pyrolytic surface fired on at over 640°C (1,200°F) make pyrolytic products more durable than sputter coating which is a low pressure technique that deposits coatings using physical vapor deposition, typically without applied heat. The pyrolytic process creates extremely durable coated products that can easily be handled, transported, and processed. These products typically combine low emissivity, solar control, low reflection, and self-cleaning properties. In addition, because the pyrolytic surface doesn’t degrade like a sputtered coating, it can be warehoused locally for availability, reducing project lead times across the country and around the world. Annealed glass is subjected to a special heat-treatment in which it is heated to about 680°C (1256°F) and afterwards cooled. When it is cooled slowly, the glass is twice as strong as annealed glass. If it does break the fragments of the broken glass may remain in the frame but are large. Heat strengthened glass is not recognized as a “safety glass” by typical building codes. Tempered glass is at least four times stronger than annealed glass. When broken, it shatters into many small fragments which reduces the potential for major injuries. This type of glass is intended for glass facades, sliding doors, building entrances, bath and shower enclosures, and other uses requiring superior strength and safety properties. Laminated glass comprises two or more layers of glass bonded together with a plastic or resin interlayer. If broken, the interlayer is designed to hold the glass together. Virtually all glass types can be laminated and the thickness and types of interlayer can be varied to provide ballistic, bomb or physical attack resistance. Laminated glass also provides attenuation of sound and can typically be cut and further processed. Pyrolytic coatings are applied during the glass manufacturing process to create a product that provides high performance and durability. The type of coated glass provides thermal control and enhanced insulation, as well as control of solar heat gain when combined with a solar control glass in either a monolithic or insulating glass unit. Low-e coatings reduce the emissivity of the glass surface meaning the glass provides greater insulation by reflecting heat back towards its source and can also be designed to absorb or reflect solar energy. As such, low-e coatings are useful for reducing both solar heat gain and heat loss. For a sense of context, uncoated glass has a typical emissivity of 0.84 while a low-e coated glass could have an emissivity of 0.15. This means only 15 percent of heat is absorbed and re-emitted while the rest is reflected. Different combinations of low-e coatings can be used in an insulated glass unit to provide the desired performance. Insulating units are two or more panels of glass bonded to a perimeter spacer material with a hermetically sealed airspace. The primary benefit is to improve thermal performance with better U-factors as well as solar control by influencing the Solar Heat Gain Coefficient (SHGC). Most types of processed glass can be incorporated into an insulating glass unit to adjust and fine tune its overall properties accordingly. Double glazed units are the most commonly used type of insulating glass unit, however in some climates the use of multi-cavity triple glazed units is increasing in response to tightening energy codes. With a basic understanding of different manufactured glass types, we can now turn our attention to particular issues that are commonly addressed in building designs to determine the best type of glass that may be suitable solutions. A great deal of the increasing emphasis on energy use in buildings has been placed on the building envelope and particularly on glass and glazing. With the increasing sensitivity toward reducing fossil fuel usage in particular, energy codes and standards have been becoming more demanding in terms of the performance of glazing. They have steadily been raising the bar on performance such that glazing needs to be carefully addressed during design and appropriately specified to both anticipate and achieve the intended energy performance. The first and perhaps most significant point about energy performance when it comes to glazing is that the building location and the orientation of the glass in respect to the sun (i.e. solar orientation) are the starting points. There is no single universal solution across all locations and all orientations. Energy codes and ASHRAE Standard 90.1 recognize this fact by identifying and defining separate U.S. climate zones which are the basis for determining all other aspects of energy performance and code compliance. From there, the codes require varying degrees thermal performance or solar control depending on location and orientation. Many commercial buildings are located in warm or temperate climate zones with internal operations that generate heat inside the building (i.e. internal heat loads). Hence, more energy may be needed to cool the building than to heat it in a typical year. Controlling the amount of heat that comes through glass in these cases becomes the dominant design issue then. It should be recognized that heat travels through glass both from the sun’s direct radiation and from the transfer of heat from the ambient exterior environment. Therefore, selecting glass that provides solar control to address both the sunlight and ambient heat reflectance will maximize performance. Glass can provide direct solar control by one of two fundamental choices. First, it can absorb a portion of the solar energy striking it through the use of absorptive colored tints or absorbing coatings added to the glass. This significantly reduces solar heat and UV light transmittance as compared to clear glass products. Tints add color to the look of the building and reduce the visible light transmittance (VLT) through the glass, all of which are variable based on the degree of tinting and color selected. The key to selecting tinted glass is finding the balance to achieve solar control, help control glare and contribute to the aesthetics of the building. Tinted glass is readily available in a variety of thicknesses (generally between 1/8 inch and 1/2 inch) and can be processed and fabricated similarly to normal float glass making it a convenient way to reduce solar gain. Tinted glass features a full range of color choices such as green, blue, blue-green, bronze, and grey colors. They commonly provide low external and internal reflectance meaning that they are not very mirror-like. They can be laminated, strengthened, and even bent using standard techniques. Further, they can be used singly or in combination with other glazing in insulating glass units. All of these traits have made tinted glass a common solar control choice in low, mid, and high rise office buildings, medical / hospital buildings, educational / school buildings and retail locations. The chart depicts the percentage transmittance of typical glass types and colors. It demonstrates how tinted glass lowers SHGC through a reduction in transmittance in the Solar Infrared region, while maintaining high light transmittance in the Visible Light region. Instead of absorbing energy, the other choice of achieving solar control with glass is to reflect it back varying degrees of solar light or heat energy (or both) by applying various coatings during manufacturing. The types and effectiveness of the coating can vary notably between glass products and between manufacturers so it is important to review the technical data to be sure that a coating is selected appropriate to the building, its location, and solar orientation. For example, a coating that produces a low SHGC value will result in very little solar heat passing through the glass while a low-e coating reduces the emissivity of glass and lowers the U-factor. Some manufacturers have coatings that will achieve both solar control and low emissivity and those should be looked at for suitability. Coated glass is available in some fairly clear versions or in a full range of colors including green, blue, blue-green, bronze, gold, and grey. The coatings also commonly reduce UV light transmittance which means fading is reduced in fabrics, artwork, etc. Coatings have been recognized as an ideal means to achieve a rather precise level of solar control for new commercial construction or renovation projects. Specifically by using different coatings on different layers of a dual pane insulated glass unit, the options and possibilities increase for balancing heat gain against light transmittance and U-factors. Hence, coated glass has been commonly used in commercial buildings requiring solar and thermal control such as low, mid and hi-rise buildings, medical/ hospital buildings, educational/ school facilities, office buildings, retail establishments, and residential structures of all types. Turning to colder climates, the approach to thermal energy performance with glass is different. In these locations, the energy required for heating is greater than for cooling over the course of the year. Hence, there is usually a desire to allow sunlight to freely penetrate into the building during the heating season to take advantage of passive solar gains. This means selecting glass with a higher SHGC may be desirable, particularly on sun facing facades. At the same time, low emissivity is desired to redirect energy (i.e. interior room heat) back into a building (rather than out of it), to achieve much lower heat loss than ordinary float glass. For such buildings, this coating is often selected to allow for enhanced clarity and light transmittance which will tend to favor a pyrolytic surface coating over a sputter coating. Once again, the use of different coatings on different layers of insulated glass units allows for some fine tuning of the glazing to suit particular circumstances of different buildings, different solar orientations and different performance needs. The surfaces of insulated glass units are identified by number such that in a typical double pane unit, surface #1 faces the building exterior, #2 is the inner face of the outer pane (in the space between the glass layers), #3 is the exterior face of the inner pane (also in the space between glass layers), and #4 faces the building interior. Usually the coatings are placed on surfaces #2 and #3 so they are not exposed. Use of a low-e coating on surface #4 in combination with a low-e coating on surface #2 provides a significant reduction in U-factor of approximately 20 percent. In order to improve the energy efficiency of insulated glass units without increasing the thickness or weight of the window, at least one manufacturer has developed a coating for the 4th surface of the double glazed unit. This 4th surface coating works in combination with a low-e coating on surface #2 to create a significant reduction in U-factor of approximately 20 percent. Pyrolytic Low-E coatings are well suited for this purpose as they provide the advantage of being very durable and difficult to damage, with a track record of use in these types of application for well over 10 years. In some cases, the visual performance of the glass may be the overriding design issue. This can be true in buildings where daylighting is being used to turn off electric lights and save energy or in cases where the ability to view through the glass with clarity and good color rendition is important. Note that all of the glass discussed for thermal energy performance provides some degree of visual performance and the glass described in this section provides some degree of thermal performance. The distinction is the degree to which the two are balanced or weighted to favor one over the other due to its specific location in a specific building. Among the things to take into account in selecting glass for daylighting is the quality of the light that will end up in the interior space. The color of the glass or the coating can affect the color of the transmitted light while clear glass will allow for more accurate color renditions. However, clear glass can be a source of glare. If the glass is not shaded, does not face away from the sun, or is not treated to reduce glare, then the shear light intensity or the high contrast between it and the other interior spaces can create disturbing and unwanted bright light. In that case people will often respond by closing blinds or otherwise block the daylight undoing the intended benefit of the design. Selecting a tinted or coated glass therefore that appropriately addresses glare while still keeping the color clear may be an optimal solution in some cases. The quality and the quantity of light are important factors for spaces that are naturally daylight using glass. In addition to letting daylight into buildings, allowing people to view out without undue color or view quality issues is also a common design requirement. Clear glass is available that offers excellent optical properties, transmitting up to 90 percent of the sun’s visible spectrum thus maintaining high clarity and low distortion with brilliant flat surfaces. It is available in a wide range of sizes and thicknesses for optimum utilization and is applicable in commercial, residential, and institutional buildings of all types. There are many interior and exterior applications where codes and general practice require the use of safety glass that reduces the possibility of injury if broken. Tempered glass is commonly used, although the tempering process introduces distortion in the glass which can give the unwanted characteristic of visual waviness. Furthermore there is a small risk of spontaneous breakage when using tempered glass, which restricts its use in certain applications. Heat strengthened and laminated glasses are options to mitigate these issues. One thing to be aware of however, is that heat treating float glass to produce either heat strengthened or tempered glass requires a focused cooling process called quenching. The quenching air jets used in a tempering furnace cannot cool the glass with complete uniformity though. As a result some areas are cooled faster than others, resulting in differential shrinkage which creates areas of different compressive stress. This differentiation can create “quench marks” due to very slight changes in the glass density which affects the light passing through the glass. Quench marks should not be considered a defect; they are an indication that the glass has been heat treated. Appearance of quench marks is dependent on lighting conditions and they can be visible in transmission and reflection, and particularly when viewing the glass at an angle other than directly facing the glass. They are more visible in thicker, clear, heat treated, glass; when a lightly reflective coating is used; or when both lights of glass in an insulating glass (IG) unit are heat treated. They become particularly visible in any glass when polarizing sunglasses are worn. Therefore, if viewing clarity is the priority, designs which do not require heat strengthened or tempered glass can be preferable to those that do. It is always important to construct a mock-up of the intended glazing design to gain an understanding of any potential issues related to distortion or quench marks. There are many applications where glass is used and great visual clarity is the major design criteria. This might include retail displays, showrooms, museums, sports stadiums, zoo enclosures and exhibits. In these cases glass is commonly used to create a physical barrier but clear visual characteristics are needed without distortion. Since visual clarity is affected by the amount of visual reflections that appear on the surface of the glass, anti-reflective glass is available to overcome this issue. It is formed by using two pyrolytic coated surfaces in a single laminated glass product to minimize visible light reflectance to less than 2 percent compared to normal clear glass which is 8 percent. This allows more than 90 percent of visible light to transmit through the anti-reflective laminated glass with very low masking reflections. In addition, anti-reflective glass can block more than 99 percent of transmitted UV thus reducing the fading of interior fabric and furnishings. As a laminated glass product, it also offers the traditional benefits of enhanced security, improved safety, and damage protection. It is possible to get anti-reflective glass tempered if increased strength is required. One manufacturer produces an anti-reflective glass that offers a lower emissivity than normal glass; giving improved thermal insulation in addition to a reflection reduction. Ordinary glass on the left can produce veiling reflections that obscure the view through to the other side. Anti-reflective glass on the right dramatically improves the clarity of objects beyond the glass. For situations where very pure color clarity and high VLT are desired, low iron glass may be worth considering. Normally, all glass has traces of iron content which is responsible for the edges of a piece of clear glass appearing green. When glass is manufactured by deliberately reducing the amount of iron present, the green edge color is reduced in intensity and the view looking through the glass is very clear. It is therefore ideal for use where glass edges are visible or where a neutral color is desired. As its light transmission is 1 percent and 8 percent higher than clear float glass in 3 mm to 19 mm thickness respectively, it is perfect for applications where transparency and purity of color are desired. It can be used in anti-reflective glass, in insulated glass units, and for maximizing solar heat gain in colder climates. Low-iron glass can also be heat treated for safety and laminated for security. All of these traits make it a high clarity choice for storefronts and displays, furniture, solar collectors, photovoltaic panels, and special applications requiring thick glass such as bullet resistant glass, aquariums etc. Low-iron glass shown on the left is more optically clear without the common green tint found in most conventional glass products as seen on the right, particularly along the glass edges. There are a number of building design situations where some very specific needs arise for glass. Manufacturers have responded by developing and testing glass products to meet those special applications. For building areas that require viewing through glass but also high levels of fire protection, then fire-resistant glass should be considered. It is specifically designed to limit conductive and radiative heat transfer with product performances ranging from 20 to 120 minutes. These glass products must always be used as part of an approved fire resistance or fire protected framing assembly. Fire-resistant glass consists of multiple laminates of float glass and a special transparent intumescent interlayer, which is totally compatible and optically homogeneous with the glass. When exposed to fire, the pane facing the flames fractures but remains in place. As the heat penetrates the glass, the interlayers react by foaming to form a thick, opaque, resilient and tough insulating shield that blocks the conductive and radiant heat of the blaze. As a design tool, it allows natural light and unobstructed views in fire rated walls, openings and doors while restricting the spread of heat, smoke, flames and hot gases. It can be combined with a full range of other glass products to address security, bullet and hurricane resistance or visual clarity requirements. These products are typically tested and classified independently by organizations such as Underwriters Laboratories (UL). Ultimately, it addresses health safety and welfare by reducing fire damage to people, property and valuables. Fire-resistant glass can be used to spread daylight and create open visual contact in areas that require fire resistance ratings in buildings. Some buildings are subject to higher levels of noise than others while some building uses are simply more sensitive to noise affecting the occupants / users of that building. Either way, unwanted noise coming from things like roadway traffic, railways, aircraft, factory operations, music, or other activities needs to be limited and controlled. Methods of creating sound insulating walls are common and fairly well known, but if those walls have windows, the glass needs to provide acoustic control as well. Noise control glass is the ideal choice in situations like this. By using a polyvinyl butyral (PVB) interlayer laminated between two layers of selected float glass, manufacturers offer a high quality product that produces excellent noise reduction without compromising on light transmittance or impact resistance. The acoustic performance can be varied by combining different thicknesses of glass with the PVB interlayer to achieve a specified rating. In this way noise control glass offers the opportunity to achieve project-specific noise reduction requirements. It is generally available in a variety of sizes and can be fabricated to meet any needed safety ratings. It can be used singly or in double or triple pane Insulating Glass Units (IGUs). Depending on the configuration and thickness of the glass, test results have shown that noise control glass can achieve STC ratings between 31 and 39. One manufacturer offers a laminate with a special PVB that specifically reduces mid-range frequencies and tests with an STC in the low 40s. Attenuation of mid-range frequencies is important as this includes sounds such as urban road traffic, railway traffic, music and factory noise. Buildings of many types that contain glazing that is difficult to reach for cleaning or simply require cleaning because of the surrounding environment can create ongoing high maintenance expenses. In response, a rather innovative glass product has been developed that uses the power of the sun to clean itself. This self-cleaning glass can dramatically reduce or eliminate window cleaning, while still offering good visual clarity and an unspoiled exterior aesthetic. This glass uses UV energy from the sun, which is abundant even on cloudy, overcast days, to keep windows clean naturally in several steps. First, a photocatalytic process generated by additives in the glass loosens dirt and gradually breaks down organic residue so it doesn’t adhere to the glass. Next a hydrophilic action on the glass surface causes rain to sheet on the glass, carrying dirt away with minimal spotting or streaking. Under most conditions, natural rain is sufficient to keep the window clean, and a quick spray with a hose will achieve the same result even in prolonged dry weather. Since the coatings used in this self-cleaning glass are pyrolytic and an integral part of the glass surface, they aren’t susceptible to peeling, separation or disintegration over time. In addition, they are not damaged by liquid glass cleaners so there is no need to be concerned about re-coating or retreating the glass. Combined in an insulating unit with an inboard lite of either low-e or solar control glass, all aspects of glazing performance in a building can be addressed and maintained. Self-cleaning glass is commonly available in clear or blue colors and a range of thickness from 1/8 inch up to ¼ inch. While all of the glass types and products discussed so far represent a fair amount of innovation and technological advances, manufacturers are continuing to pursue even more ways to address building design issues through advanced products. Some of these include the following cutting edge glazing innovations. A vacuum, is very effective at minimizing conduction and convection heat losses. While a perfect vacuum with zero heat transfer is not easily achievable, it is possible to produce a partial vacuum with notably reduced heat transfer. These insulating principles of vacuums are being applied by some manufacturers to create a high performance glass with a thinner profile. They are offering vacuum insulated glazing that is different than conventional double glazing in that the air between the two panes of glass is extracted, to create the needed vacuum. In order to keep the panes from collapsing in on each other, micro-sized spacers are used to keep the panes apart. Nonetheless, the gap between the two panes can be reduced to just 0.2 mm, giving the glass an overall thickness of just over 6 mm (1/4 inch). Heat flow through radiation can be reduced by covering one of the glass panes with a low-emissivity coating, similar to that used in conventional double glazing. Therefore, despite its thin profile, vacuum insulated glazing can achieve U-factors as low as 0.18 Btu/hr.sqft°F in a ¼ inch profile. That means the same or better thermal performance is achieved as conventional double glazing but in one quarter of the thickness and two thirds the weight. That makes it ideal for retrofit or historic preservation projects where an existing window sash or frame needs to be preserved and conventional insulated glazing units won’t fit. Thus it balances historical preservation with modern comfort and environmental requirements while allowing windows that are more in keeping with the original design. There are of course some variations available for vacuum insulated glazing. For locations that require solar control, the coated surface can be designed to achieve the needed SHGC. For situations that can accommodate the width of IGUs, it is possible to use a triple glazed, coated vacuum insulating glass unit that gives U-factors as low as 0.12 Btu/hr.sqft°F. This combination uses a vacuum insulated glass unit with a conventional spacer, gas fill and a coated outer pane to create a hybrid unit with superior thermal performance. Both designs allow for minimum disruption in existing buildings making it a cost effective method of improving the energy efficiency. The vacuum also allows for improved acoustic performance over single glazing, enhancing the living and working environment. While this is regarded as an emerging technology in the US, it should be noted that it has been successfully used in Japan for over fifteen years and is really a proven solution. Vacuum insulated glazing uses clear micro spacers to keep the panes separated but still allows for good visual clarity in the size and weight of glass suitable for historic renovations. Manufacturers continue to expand and develop the range of coatings that can be used on glass to meet very specific and special needs. As a result, specialty glass has become available that can be used to meet those needs. 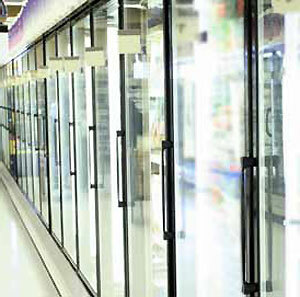 For example, controlling condensation on glass doors of built in refrigerators / freezers in supermarkets or other retail settings can be an ongoing problem both for maintenance and for visibility of merchandise. As a result, electrically conductive glass has been developed that allows the glass to be electrically heated and overcome this problem. It is color neutral, minimizing reflected color and will not change over time. It easily fabricated with a durable pyrolytic coating that can be handled, cut, insulated, laminated, heat-strengthened and tempered and is even bendable. The heated glass is scratch and abrasion resistant and is available in a variety of glass thicknesses and sheet resistances ranging from 5 ohms/square up to several thousand ohms/square. As a result, heated glass combines thermal control with superior electro-optical properties to keep merchandise clearly visible. Heated glazing has also been used in a variety of architectural applications, such as in restaurants where thermal comfort of the diners is important. Here the heated glazing provides heat to the building occupants. Other specialty glazing has been developed for electro-optical applications such as computer screens or touch screens in buildings or glazing that will control static when touched. For buildings that want to use photovoltaic (solar-electric) energy, specialty glass and glazing has been developed for both rigid panels and thin film applications. The rise in the use of building integrated photovoltaic cells (BIPV) is made possible because of the effective development and proper use of this type of specialty glazing that maximizes the energy generating potential of these systems. Electrically conductive specialty glass can be used to keep glass panels clear in retail settings where commercial refrigeration is used. When glass is tinted or coated it achieves the resultant performance properties permanently. This means that the glass performs the same way all the time regardless of any changing light conditions outside. An innovative alternative is to use glass that can literally be switched from clear, to lightly tinted to dark tinted and levels in between. This is being achieved by using electrochromic coatings which are applied to panes of conventional float glass or float glass coated with transparent conductive coatings. Electrochromic coatings are typically metal oxides and are thin films like other glass coatings. When a very small electric voltage is applied across the coatings, ions travel between layers, where a reversible solid state change takes place, causing the coating to tint and absorb light. Reversing the polarity of the applied voltage causes the ions to migrate back to their original layer, and the glass returns to its clear state. This ability to switch glass back and forth at will is particularly useful and desirable in large daylit spaces where different uses and lighting conditions dictate different needs for the glass. Typically electrochromic glazing should be integrated into the building control system to maximize efficiency. Other types of switchable glazing are available, including LCD based privacy glass and thermochromic and photochromic based materials. The US Green Building Council (USGBC) has developed the LEED® rating system for green buildings which has been recognized as the leading green building standard in this country. The LEED 2009 system is in place until the year 2015 which overlaps with LEED version 4 introduced late in 2013. Since buildings are currently being designed under both systems, credits available for both are summarized below which properly selected glass products can contribute to. Both LEED 2009 and LEED v. 4 place a strong emphasis on reducing the use of fossil fuels and increasing the use of non-polluting renewable energy. As we have seen, the range of glass products available allow architects and other design professionals to truly optimize performance by selecting glass that is coated, tinted, or otherwise fabricated to best suit a particular building and its location, and even vary the selections to suit individual building facades and installations. If on-site renewable energy is pursued, it is likely that photovoltaic solar cells will be considered which the properly selected glass will support and make possible. In order to receive points in this credit category the building must demonstrate a percentage increase in energy savings in accordance with ASHRAE standards. The number of points earned depends on the degree of energy savings and/or the amount of energy generated on site. Solar photovoltaic systems rely on appropriate solar glass to allow the optimization of energy being produced without relying on any fossil fuels. • MR Credit 4: Recycled Content: 10 percent and 20 percent (1 – 2 points) Post-consumer glass is a highly recyclable material that can be re-used or repurposed into a variety of products such as glass containers, counter tops and landscaping material. However, it cannot be utilized in the float glass manufacturing process since even the smallest impurity can compromise the product quality and manufacturing process. Therefore, float glass manufacturing cannot utilize recycled glass as defined by the LEED rating system. • Credit 5: Regional Materials (1 – 2 points). Many glass manufacturing plants are located throughout the USA meaning a regional material contribution is possible depending on proximity to the building. The Materials and Resources category under LEED v. 4 takes a rather different approach to defining the green nature of building products. The new approach focuses on the full life cycle of those products. The key documentation needed to demonstrate performance under this approach is referred to as an Environmental Product Declaration (EPD). Individual manufacturers or a trade association can prepare specific or generic EPDs for products. In the case of glass products, check with the manufacturer to see what is available for documentation to earn the appropriate points for this updated category. Under IEQ Credit 8.1 Daylight & 8.2 Views, glass plays a very significant role as has been discussed. The beauty of the range of glazing choices is that daylight can be brought into spaces while still addressing the thermal needs of the building and without blocking the view. Glass products have daylight transmissions ranging from 92 percent down to 8 percent, when single glazed. As outdoor daylight (no direct sun) is in the 1,000 to 2,500 foot candle range, even the lowest transmission (darkest) glass in large sizes, can meet the minimum credit requirement with only 8 percent transmittance of 1000 foot candles (i.e. 80 fc luminance). Under both LEED 2009 and LEED v. 4, credit is given for recognized innovations that exceed minimum performance levels in green building components or systems. Hence, it is entirely possible to achieve some additional credit by using some of the innovative or emerging technologies related to glass that improve on LEED minimum performance levels. More significantly, it is possible to show innovation by using these systems to improve the building overall by finding appropriate ways to address differing needs and strike the right balance between them under different operating conditions. • Architect: Daniels and Zermack Associates, Inc. Celebrating its grand opening of a new headquarters building in East Lansing, MI, the Michigan State University Federal Credit Union (MSUFCU) is setting the standard for green construction and sustainable design. The new Gold LEED® Certified, 145,000-square-foot building, along US-127, is the permanent location for the company headquarters. Operating for over 73 years, MSUFCU is the largest university-based credit union in the world. With its primary focus being its members and community, the construction of the new headquarters building proves to be a valuable contribution. MSUFCU in collaboration with Architects, Daniels and Zermack Associates, Inc. in Ann Arbor, MI, have integrated green design and construction materials for an energy efficient, sustainable project. Daniels and Zermack have been providing innovative building design to financial institutions for over 60 years. The full service firm specializes in new construction, additions, planning, and renovations. Greg McKenzie, AIA, Principal-in-Charge of the project, took the efficiency of the building into great consideration during design. McKenzie worked closely with Glazing Contractor, Calvin and Company of Flint, MI and Glass Fabricator, PDC Michigan of Plymouth, MI to select the best possible glass choices to achieve the desired outcomes. The four story headquarters building showcases 44,000 square-feet of solar control, low-e glazing selected for this project because it provides a perfect blend of visible daylight along with low solar heat gain. The low-emissivity properties combined with solar control result in energy cost reductions compared to ordinary glass. Overall, nearly 80 percent of the building takes advantage of natural day lighting to reduce the need for artificial lighting,” according to McKenzie. However, MSUFCU wanted a building that did not require the use of blinds since they were viewed as an added cost that compromises the appearance of the building from the exterior. The selected glazing provides glare control which allows for this design option. The contemporary building design blends the aesthetics of all the branch locations, which showcase brick and green glass facades. McKenzie said, “The glass is a great color match and we are very pleased with the result.” The building’s attractive low-e glass facade allows natural light in, absorbs and blocks solar energy, reducing the amount of heat that can enter the building. It combines great aesthetics, solar and thermal performance, subtle reflectivity and glare control all in the final design. Architects design buildings to meet a variety of criteria and in so doing combine professional skill with appropriate material and product selection. Float glass has been shown to be a vital and integral building material that is manufactured in a full range of products to address many general and very specific design issues. As such, architects are now able to select specific glass products for different projects and façades from a vast range of combinations of tempered, laminated, tinted and coated glass. By understanding the differences and benefits between the different manufactured choices the performance, aesthetics, and functionality come together to create building designs that can meet or exceed expectations.